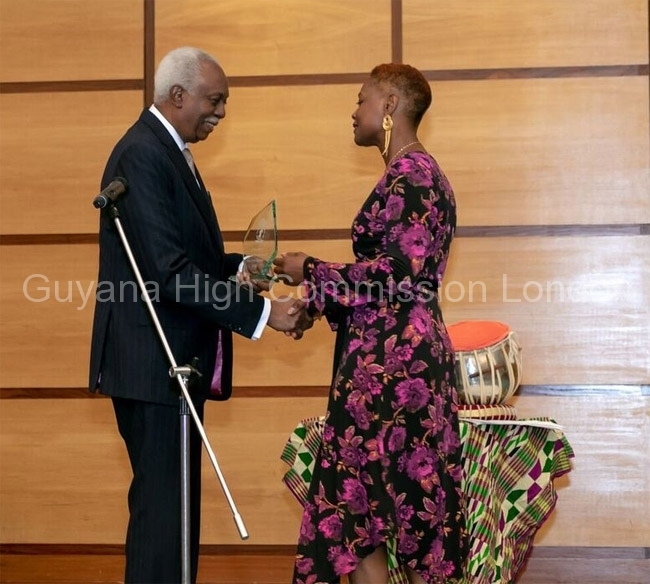 The Guyana High Commission UK Awards Ceremony 2018 took place on Saturday 15th September in London. The categories are listed below. Rod and Juanita Westmaas have a passion for all things Guyanese. In January 2017, together with Ra Hendricks and with the support of Tafawa Ntune, they launched the popular Guyana SPEAKS monthly programme of activities in Tooting. Tafawa Ntune is one of the founding members of the Guyana UK Social Development Association. through his voluntary work with this organisation, Tafawa has played a leading role in keeping Guyanese culture and pride alive in the UK. Community-centred and dedicated, John Mair has put on over fifty events at the Guyana High Commission celebrating the work of Guyanese writers, artists and intellectuals. Doris Harper-Wills: Through her skills in dance, poetry and story-telling, Doris has become a legend in the Guyanese community in the UK. She has championed Guyana's rich cultural heritage for over forty years. The remarkable Grace Nichols is the author of over twenty books and the winner of the 1983 Commonwealth Poetry Prize for her collection "I is a Long-Memoried Woman". In addition to this prestigious award, Grace has also won the Arts Council Writer's Award and the Cholmondeley Award. Professor Ansari Ramjohn is the first Professor of Law of Guyanese descent in the UK. He has written more than twenty books on trusts, evidence and revenue law. Professor Ramjohn is the co-founder of the Guyana Law Association, an organisation that works to support the Guyanese judiciary and the University of Guyana. Sherry Ann Dixon is the embodiment of her grandmother's motivational words: "You can do anything you want". She is an award-winning media professional, public speaker and journalist who has won a number of prestigious awards, including the African-Caribbean Community woman of the Year Award. Over the past decade Andre Braithwaithe has excelled as a digital artist with accomplishments in a number of high-profile Hollywood franchises, including Avatar, Harry Potter and Mission Impossible - Rogue Nation. Driven by a desire that supports his artistic expression, Andre recently completed an MSc in computer Science. Gina Miller rose to prominence as a leading figure when she successfully mounted a legal challenge against the British Government over the process for exiting the European Union. In recent months she has been involved in a number of campaigns in support of a "people's vote" on the options for Brexit. In October 2017 she was named as Powerlist's "most influential Black person". Samantha Tross has earned the distinction of being the UK's first Black female orthopaedic surgeon. Samantha is a fellow of the Royal College of Surgeons and has featured as one of a hundred most influential Black Britons and as one of Tatler's one hundred most influential doctors in the UK. Winner of "The Voice" BBC 2014 , Jermain Jackman has an ambition to become the UK's first Black Prime Minister and he is currently studying politics at the University of Leeds. He's an NCS Media & Political Engagement Consultant and an ex-member of Hackney Youth Parliament. This young man indeed has all the makings of a Rising Star. Cheriece and Shannon Hylton are both world-class sprinters. Born in the UK and of Guyanese ancestry, these twin sisters have excelled in their various competitions. Cheriece competes in the 200m and 400m track events Shannon competes in 100m and 200m track events. Arthur Torrington CBE is the co-founder of both the Windrush Foundation and the Equiano Society. His tireless work to raise awareness of the contribution of the Windrush generation is a lasting gift to current and future generations. Arif Ali is the founder of the prolific and much-loved Hansib Publications. It is testament to his faith and foresight that many young scholars have gone on to establish successful careers after being published by Hansib Publishing. Alift Harewood MBE is someone of whom we should all be proud. A registered nurse, mid-wife and occupational nurse. Cllr. Alift has been very active - politically, socially and in her community in Macclesfield, becoming its first Black Alderman and its first Black Mayor. Joyce Trotman embodies the spirit of excellence and forbearance of Guyana's Windrush women. Joyce worked as a teacher in London's East End throughout and eighties and dedicated her early career to the education of young people. A phenomenal and inspirational communicator, Roy Sawh was, between the late 1960's and early 1980's, one of the foremost orators in Hyde Park. Using humour and and passion he commanded some of the largest crowds. Roy helped start the Free University for Black Studies, which led to the establishment of Black History month. Maureen Eneberi,/span> migrated to the UK in 1965. She is a UK registered nurse midwife, community nurse manager and teacher. Her twenty-eight years of love and clinical expertise were recognised by the renaming of the Newham continence facility as "The Eneberi Clinic" - lasting tribute to Maureen. Peter Kempadoo arrived in the UK in 1950's and as worked as a broadcaster and writer. His first novel, "Guyana Boy", is not only the first published novel by an Indian-Guyanese writer, it is also one of the few works of literature to celebrate the history and culture of the country's minority South Indian community. Born in Guyana in the 1920's, Eric and Jessica Huntley moved to the UK in the 1950's. Through their work in publishing and in their commitment to activism and community, and they have been beacons to Londoners of all backgrounds. Wilson Alexander Shervington(Posthumous) settled in the UK in 1949. In 1962 he established one of the first Black-owned motor mechanic shops where he provided employment for other immigrant workers. In 1993 he founded his charity, The Shervington Third World Trust, to support, schools, hospitals and care facilities in Guyana, the wider Caribbean and Africa. Winston Isaacs (Posthumous) was born in Guyana and migrated to the UK in 1961. In 1970 he opened the world-renowned Splinters of Mayfair hair-dressing salon in London. Winston departed in March 2016 leaving an inspirational legacy of selfless care, passion and professionalism in his craft.